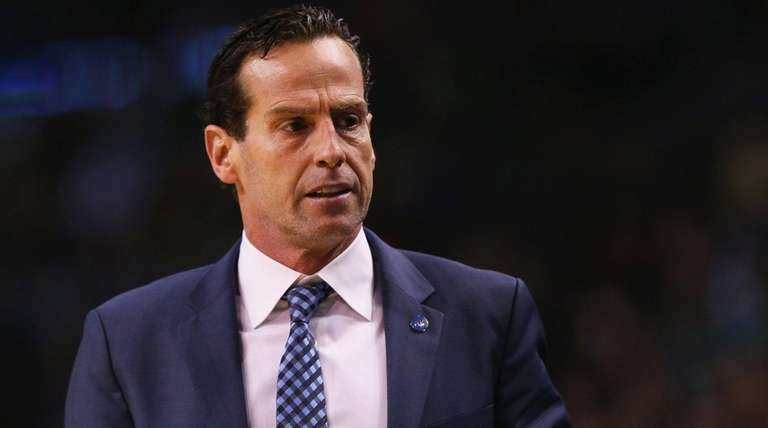 LAS VEGAS — Kenny Atkinson’s summer plans changed drastically April 17, when the former Hawks assistant was named coach of the Nets. Instead of taking time to recover after a grueling season that stretched into the playoffs, the first-time head coach instead had to focus on rebuilding a team that finished 21-61. At least the 49-year-old Long Island native has gotten the chance to spend a few days in Vegas, albeit in an official capacity coaching the Nets’ entry in the Las Vegas Summer League. “I don’t think the playoff run in Atlanta set me back, but as soon as I finished in Atlanta, I came to Brooklyn,” Atkinson said after the Nets defeated the Cavaliers, 79-73, Saturday in their summer league debut. “Everyone was telling me to get rest, but I felt like I had to be on the job ASAP because it’s on my ledger now. I’m glad I did it. In that first game, the Nets struggled to run Atkinson’s offense, which includes elements borrowed from the Hawks and Spurs. In the second half, shooting guard Sean Kilpatrick, who played for the Nets last season, calmed the team down. Although the Nets struggled on offense early against the Cavs, their defense was solid, allowing only 34-percent shooting. Atkinson hopes to see gradual improvement from his team, which won two of its first three games. Atkinson is known for developing guards, especially point guards. He was a Knicks assistant from 2008-12 and worked with Jeremy Lin, who signed with the Nets during free agency. Atkinson also helped to turn former Atlanta point guard Jeff Teague into an All-Star and developed Dennis Schroder, who will run the point for the Hawks next season. Atkinson’s hiring pleased Kilpatrick, whose 19 points led the Nets in their first summer league game. Atkinson hopes to turn Isaiah Whitehead, the 42nd pick in the NBA Draft out of Seton Hall, into a point guard. Whitehead has struggled with turnovers but Atkinson is happy with his defensive effort. Nets sign Foye, Bennett. The Nets announced they have agreed to deals with guard Randy Foye and power forward Anthony Bennett.